The mass of knowledge called Veda was divided into four – Ṛgveda, Yajurveda, Sāmaveda and Atharvaveda. Sāmaveda is formed by assigning music to the Mantras in Ṛgveda. The system of music has emerged from Sāmaveda and is called Gāndharvaveda. Originally, Sāmaveda had had one thousand śākhas (branches). Unfortunately only three branches could survive the test of time and the number of learners of Sāmaveda today is meagre. The Mantras of Sāmaveda are used in Yāgas and the priest who recites them is called Udgātā. Sāyaṇācārya did a commentary on Sāmaveda. The Prātiśākhyā (grammar) of Sāmasaṃhitā was authored by Puṣparṣi. Śākaṭāyana’s “Ṛktantram” is a popular Prātiśākhyā. According to Mahābhāṣyam (Paspaśā), Śrīmadbhāgavatam (12-6-76-79), Caraṇavyūhapariśiṣṭam, Sarvānukramaṇī and Viṣṇupurāṇam, Sāmaveda has one thousand śākhas (branches). Even Divyāvadānam, a work on Bauddham enumerates the thousand śākhas. I am Svara (accent in the form of a song) and you are Ṛk, I am Sāma and you are Ṛk, I am heaven and you are earth, so let us get married and have children. Except seventy five, the Mantras in Sāmaveda are borrowed from the eighth and ninth Maṇḍalas of Ṛgveda. Since Gānam (music) is important in Sāmaveda there are no Vikṛtipāṭhas like Jaṭa, Mālā, Ratha, Ghana etc. Only Padapāṭha and Stobhapāṭha are available. Out of the thousand śākhas of Sāmaveda, only three are available – Rāṇāyanīyaśākhā, Kauthumaśākhā and Jaiminīyaśākhā. Sages Rāṇāyani, Kuthumi and Jaimini were the perceivers and propagators of these branches. Kauthumaśākhā has got two Brāhmaṇas – Tāṇḍyabrāhmaṇam and Chāndogyabrāhmaṇam. Talavakārabrāhmaṇam is related to Jaiminīyaśākhā. There is neither Āraṇyakam nor Upaniṣat to Tāṇḍyabrāhmaṇam. Chāndogyabrāhmaṇam has got no Āraṇyakam but there is Upaniṣat called Chāndogyopaniṣat. The Āraṇyakam of Talavakārabrāhmaṇam of Jaiminīyaśākhā is called Jaiminīyopaniṣadbrāhmaṇam. There are four Upabrāhmaṇas of Sāmaveda – Sāmavidhānabrāhmaṇam, Devatādhyāyabrāhmaṇam, Saṃhitopaniṣadbrāhmaṇam and Vaṃśabrāhmaṇam. Finally, there is only one Āraṇyakam for Sāmaveda – Jaiminīyopaniṣadbrāhmaṇam. Pūrvārcika and Uttarārcika are the two parts of Sāmasaṃhitā. A group of Ṛks is called Ārcikam. In Pūrvārcika there are six Prapāṭhakas, each consisting of two Adhyāyas (chapters). There are twelve Adhyāyas in Pūrvārcikam. A group of ten Mantras is called a Daśati. In the first five Prapāṭhakas, there are ten Daśatis each. In sixth Prapāṭhaka there are nine Daśatis. In brief, there are six Prapāṭhakas, twelve Adhyāyas and fifty nine Daśatis in Pūrvārcikam. In the first twelve Daśatis the praise of Agni, in the next thirty six Daśatis the praise of Indra, who consumes Soma, and in the last eleven Daśatis the praise of Soma is seen. Uttarārcikam consists of nine Prapāṭhakas. In each Prapāṭhaka there are two or more portions of which each one is called Adhyāya or “ardha”. In each Adhyāya, the Mantras usually are arranged in groups of three.Every first Mantra is seen in the Pūrvārcikam also. In the first five Prapāṭhakas there are two Adhyāyas each and in the last four Prapāṭhakas three Adhyāyas, making a total of twenty two Adhyāyas in nine Prapāṭhakas. The Mahānāmnyārcikam, which exists between Pūrvārcikam and Uttarārcikam and wherein the praise of Indra is made, has got ten Mantras. Unlike other Mantras these do not have Ṛṣi, Devatā and Chandas. The six Prapāṭhakas of Pūrvārcikam account for five hundred and eighty five Mantras, whereas one thousand two hundred and twenty Mantras are there in the nine Prapāṭhakas of Uttarārcikam. Some scholars add the fifty five Mantras of Āraṇyakakāṇḍa and ten Mantras of Mahānāmnyārcikam and put the total number of Mantras of Sāmasaṃhitā at one thousand eight hundred and seventy. One thousand five hundred and four Mantras are borrowed from Ṛgveda and seventy five are independent Mantras. Padapāṭha (splitting into words) and Stobhapadapāṭha are two kinds of Pāṭhas (texts) of Sāmasaṃhitā. Generally any different text of a Saṃhitā, such as Pada, Krama etc. 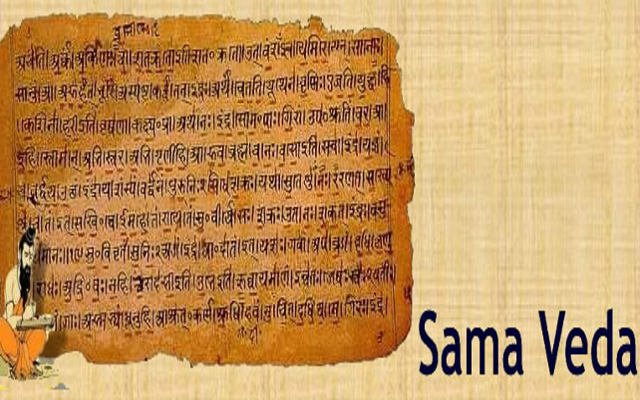 are meant for preserving the original text of Veda. But in the case of Sāmaveda the Stobhapāṭha is for assisting the Gānam (music). While performing the Sāmagānam, some letters are prefixed and suffixed to the Ṛk and such letters are called Stobhākṣaras (letters for Stobha). The Padapāṭha associated with Stobhākṣaras is called Stobhapadapāṭha. “Hoyi, hrīvā” – are examples. The prefixed Stobha is called “Anvayi” and the suffixed one is “anuṣaṅgi”. The Gānam is of two types – Prakṛti and Ūha. Prakṛti is of two kinds – Grāmageya (fit to be sung in a village) and Araṇyageya (fit to be sung in a forest). This is called Gānasaṃhitā (Prakṛti + Ūha). The Ūha, related to Grāmageya is “Ūhagānam” whereas that of Araṇyageya is “Rahasyagānam”. Sarvānukramaṇikā says that there are seven Gānas in Prakṛti and Ūha consists of seven Tantras. Gāyatram, Āgneyam, Aindram, Pāvamānam, Parvatrayam (three Parvas, viz. Arkaparva, Dvandvaparva and Vrataparva), Śukriyam and Mahānāmnī – are the seven Gānas of Prakṛti. The seven Tantras of Ūha are – Daśarātram, Samvatsaram, Aikāham, Ahīnam, Satram, Prāyaścittam and Kṣudram. One should keep in mind the seven Svaras, three Grāmas, twenty one Mūrchanas and forty nine Tānas. Udgātas sing in the form of Stotra during morning, afternoon and evening at Mandra (slow), Madhyama (medium) and Tāra (top / high pitch) levels. Singing (Gānam) a Ṛk with many Svaras (accents) is called “Sāma”. In Prakṛti, generally, a single Gānam is performed for a single Ṛk. In certain cases, there can be upto sixteen Gānas. There are eighteen Gānas for a single Ṛk. Rathantarasāma, Bṛhatsāma, Vāmadevyasāma etc. are the names of different Gānas of a single Ṛk. om āyāhi vītaye gṛṇāno havyadātaye (Udgītha) – Here, “om” is used in the beginning of the Ṛk. In Ṛgveda “om” is called Praṇava whereas the same is “Udgītha” in Sāmaveda (says Chāndogya). nihotā satsi barhiṣi om (Pratihāra) – The Ṛtvik (priest) completes the Ṛk with “om” and this is called Pratihāra. nihotā satsi ba (Upadravam) – This is sung by Udgātā. barhiṣi om (Nidhanam) – This is recited in chorus by Prastotā, Udgātā, Pratihartā etc. Certain Śabdas in Sāmagānam such as “au, hau, vā, hā” do not have any meaning but are useful in preserving the Geya, i.e. protecting it from deformation. The difference between Rāṇāyanīya and Kauthumīya branches is related to nomenclature mainly – the former takes up Prapāṭhaka – Ardhaprapāṭhaka – Daśati whereas the latter counts by Adhyāya-Khaṇḍa. In certain places differences in Svara (accent) and difference in text is seen. Kauthumīyas say “hā u” while Rāṇāyanīyas say “hāvu” – also – “rāi” and “rāyi”, “no” and “ṇo” etc. Different versions are found in Jaiminīyasaṃhitā. Nāradīyaśikṣā correlates the seven Svaras of Sāmaveda with the popular Svaras in Gāndharvaveda (sa, ri, ga, ma, pa, da, ni). The first Svara of Sāma, called Kruṣṭa, is Madhyama of Veṇu (flute), Prathama is Gāndhāra, Dvitīya is Ṛṣabha, Tṛtīyā is Ṣaḍja, Caturtha is Dhaivata, Pañcama is Niṣāda and Ṣaṣṭha is Pañcama, as shown in the table. The seven Svaras, viz., Niṣāda etc. are born out of the three main Svaras, viz. Udātta, Anudātta and Svarita and this aspect is explained in Nāradīyaśikṣā. In order to provide Ṛkpāṭha (the text of Ṛgveda) that is useful for Sāmagas (those who do Sāmagānam) there are two treatises – Chandaḥ (popularly known as Yonigrantha) and Uttarā. The former contains the list of Ṛks that are the origins of different Sāmas (In Sāmaveda the order of Mantras does not strictly follow the one in Ṛgveda). In Uttarāgrantha Sūktas (groups of Ṛks) called Tṛcas are listed. In a Tṛca the first one is the original Ṛk from Chandaḥ and the other two are from Uttarā. There are more than one hundred and fifty Maharṣis (great sages) who have perceived Sāmamantras. This Maharṣi had perceived some Mantras in forty three Daśatis. In thirty six Daśatis of Sāmasaṃhitā there are Mantras perceived by Vāmadeva. Also called Kāśyapa as he was born in the clan of Kaśyapa. He was the son of Medātithi. Kaṇva is Mantradraṣṭa of some Mantras in twenty nine Daśatis of Sāmasaṃhitā. Vālakhilyas are sixty thousand and were the children of Santati and Kratu. They are considered important although they are Draṣṭas of less Mantras in three Daśatis. There are other Ṛṣis such as Kaśyapa, Rebha, Atri, Vatsa, Bharga, Virūpa etc. who are Mantradraṣṭas of Sāmaveda. His abode is earth and he is the perceivable God. The altar of Yajña (Yajñavedikā) is his seat. Among Vaidikadevatas Agni occupies the second place after Indra. Space is his abode. Indra is the head of Vaidikadevatas. He likes Somapānam very much. Indra’sVajrāyudha (the diamond weapon) is made of the bones of Dadhīci. Providing light, rain and all kind of wealth are his important duties. Earth is the abode of Soma. It is a creeper available in plenty in the mountains of North India. Soma grows well in a hill called “Mūjavam”. The creeper is crushed with stone tablets and juice is squeezed. The filtered Somarasa is called “Pavamānam”. It is customary for Vedic sages to call the combine of Somalata and deity considered as Adhidevatā (chief) by the name “Soma” or “Pavamāna”. Somarasa pleases Indra and Devatas and as such it has occupied an important role in Yajña. Having offered to Devatas the performer of Yajña also consumes it. Such a person is called Somapīthī. She is a female deity having her abode in Antarikṣa (sky). Uṣas shines with her reddish light just before Sunrise. Antarikṣam (sky) is the abode of Sūrya. A God perceivable, Sūrya is the Ātmā (soul) of the universe and provides health, glow and strength. Antarikṣam is his abode. Described as omnipresent and Trivikrama, Viṣṇu is the symbol of the universal power. Puruṣa is described as the very cause of this universe (Pūrvārcikam 6.4.3.6) and this portion is very popular as Puruṣasūktam. In Pūrvārcikam there are six Prapāṭhakas. Second Prapāṭhaka – It consists of ten Daś Agni, Indra, Savitā etc. are the main deities. Fourth Prapāṭhaka – This is a Prapāṭhaka having ten Daśatis related to the praise of Indra, Uṣas Agni, Viśvedevas, Dyāvāpṛthivis etc. Fifth Prapāṭhaka – In the ten Daśatis of this Prapāṭhaka there are the praises of Indra, Āditya, Maruts, Viśvedevas, Aśvins, Soma, Pavamāna, Agni, Sūrya and Savitā. Sixth Prapāṭhaka – Only nine Daśatis are there in this Prapāṭhaka and it is earmarked for Pavamāna, Soma and Indra. There are ten Sāmas in this. The praises of Indra etc. is the subject matter. First Prapāṭhaka – In the twelve Daśatis of this Prapāṭhaka there are praises of Agni, Mitrāvaruṇa, Indra, Pavamāna and Soma. Second Prapāṭhaka – Pavamāna, Soma, Agni, Mitrāvaruṇa and Indra are praised in twelve Daśatis in this Prapāṭhaka. Third Prapāṭhaka – In the fourteen Daśatis of this Prapāṭhaka, Pavamāna, Soma, Agni and Indrāgni are praised. Fifth Prapāṭhaka – Pavamāna, Soma, Agni and Indra are praised across the twelve Daśatis of this Prapāṭhaka. Eighth Prapāṭhaka – Praises of Agni, Indra, Viṣṇu, Vāyu, Pavamāna, Soma etc. are there in the thirteen Daśatis of this Prapāṭhaka. Ninth Prapāṭhaka – Pavamāna, Soma, Indra, Agni, Maruts, Sūrya etc. are praised in nine Daśatis of this Prapāṭhaka. Nāradīyaśikṣā says that Sāmaveda is the root of an Upaveda called Gāndharvaveda, that deals with Indian traditional music. Gāndharvaveda elaborates Sāmagānam also. It proposes Tauryatrikam, viz. Nṛtya (dance), Gīta (singing) and Vādya (musical instruments), seven Svaras, three Grāmas, twenty one Mūrchanas and forty nine Tānas. Sāmavedasaṃhitā, Ed. SriramSarma, SamskritSamsthanam, Bareli, UP, 1965. Mahābhāṣyam, Six Parts, Chowkhamba Sanskrit Pratisthan, Delhi, 1987. The Bhagavadgītā with Eleven Commentaries, Gujarati Printing Press, Bombay, 1935. Śrīmadbhāgavataśrīdharīṭīkā, Chaukambha Sanskrit Pratisthan, Delhi, 2003. Caraṇavyūhasūtra with the commentary of Mahidāsa, Chaukambha Sanskrit Series Office, Benares, 1938. Viṣṇupurāṇam, Ed. Annangacharya, Kanchipuram, 1972. Mīmāṃsādarśanam (with Śābarabhāṣyam), Ed. Vasudeva Abhyankar, Ambadas Joshi, AnandasramaSamskritaGranthavali, Poona, 1976. Chāndogyopaniṣat with commentary of Śaṅkarācārya, Vol.s 6, 7 of Works of Śaṅkarācārya, Vani Vilas Press, Srirangam, 1910. Mahābhārata with the commentary “Bhāvapradīpa” of Nīlakaṇṭha, Gopal Narayan & co., Bombay, 1901. Kātyāyana’s Sarvānumkramaṇī, Ed. by A. A. Macdonell, Clarendon Press, Oxford, 1886. The Divyāvadāna, Ed. E. B. Cowell, R. A. Neil, University Press, Cambridge, 1886.